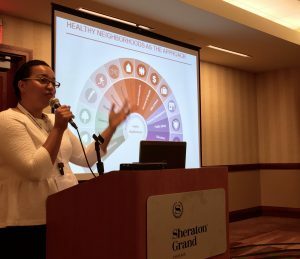 Romi Hall, Healthy Neighborhoods Manager at the East Bay Asian Local Development Corporation (EBALDC) in Oakland, CA., highlights her participation at the 2016 National Association of City and County Health Officials (NACCHO) Conference in Phoenix, AZ. Romi Hall presenting on EBALDC at NACCHO 2016. After one of our panels an attendee shared with me that they had no idea what the Community Development field can do. They came from a local health department and had a public health background so exposure to the community development field was relatively new. In particular, they were curious how debt can be leveraged to finance community health initiatives to address the social determinant of health like housing, food access, and jobs. The Network has a great blog post highlighting the different methods of funding that community development accesses. Are there any buzzwords that came up that you’ve been thinking about? Perhaps not buzz words, but the continuing conversation and differences between public health and population health. Each sector has their own jargon, which can be tricky to navigate when doing cross sector work. The Network has developed a Jargon Buster to help break down this barrier. A few other concepts that came up were “hotspotting” and inside/outside strategy. Another interesting idea I heard was talk of funders and Community Development Financial Institutions (CDFI’s) putting funds together to leverage investment to yield health results, such as co-locating housing, health care, and other services. 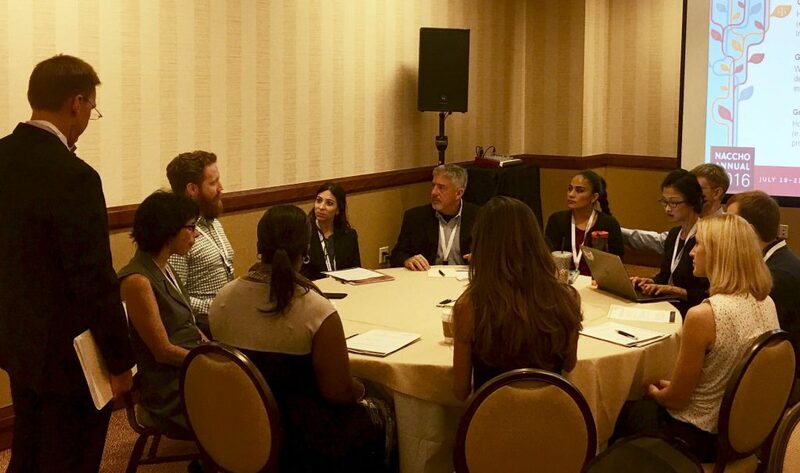 Interactive small group discussion at NACCHO 2016. It was really interesting being on the other side of the table- sharing with public health officials why they should work with community development corporations (CDC). I am so immersed in my world and in Oakland and work with a dynamic county health department who understands the importance of the community development industry, it was nice to step back and really think of how best to connect and convey the importance of community development partners to catalyze results. I realized, I usually speak to audiences who generally get what I do, and it was great to pull back and think big picture about the work. Made me more invigorated and excited! Last, I was surprised by how attendees’ ideas of partnership outside of public health generally were constrained to Federally Qualified Health Centers (FQHC’s) or hospital/health care systems rather than more broadly with other city or county agencies or community based organizations (CBO’s). So interesting, again, because the cross-sector work we do just feels like the norm in the Bay Area. It was really interesting being on the other side of the table- sharing with public health officials why they should work with Community Development Corporations. What can community development learn from public health? I think in order for public health to have greater outcomes in their work and better support the overall health and well-being of residents, particularly children, deepening their relationships with community development corporation (CDC) partners and CBO’s is key. To this end, CDC’s can get to know their local health partners and come back to their roots of making long-lasting community change by bringing a social determinants of health frame to their work. This would help ensure long-term and holistic solutions to improve the outcomes we are seeking in communities. I think folks are starting to open their eyes more to this world of CDC’s and starting to get acquainted with a new player. And, with a limited number of resources and an increasing need for folks to further anchor into what they do and align with others, I can see the shifts in even the partners we have at the table- towards seeing how their different work can collectively advance the people, families, children, and neighborhoods they have the opportunity to serve. Romi Hall, MPH joined the East Bat Asian Local Development Corporation (EBALDC) in 2014 as its Healthy Neighborhoods Manager. In this role, Romi is the lead project manager for the implementation of the San Pablo Area Revitalization Collaboration, a partnership of organizations, institutions, and residents working together to co-create a healthier, safer and more vibrant economic and residential corridor in three neighborhoods within West Oakland. Prior to joining EBALDC, Romi worked for county-based First 5 Alameda County coordinating a county-wide early childhood developmental screening program in pediatric offices, child sites, and homes. Romi was also a project manager working on the planning and implementation of 24:1, a comprehensive, community development initiative and collaborative in St. Louis that was featured in the White House Neighborhood Revitalization Report- “Building Neighborhoods of Opportunity.” In this role, Romi was awarded Romi the National Award for Excellence in Community Building and Organizing through Neighborworks America and the Emerging Maternal and Child Health Leader for the St. Louis Region from the St. Louis Maternal and Child Health Coalition. Romi holds a Master in Public Health from Drexel University and BA in Journalism from the University of Nevada, Reno.